Conner Coscino attempts a tag on Calvary Chapel base runner Wednesday, April 19. Photos by Kim Blaser. 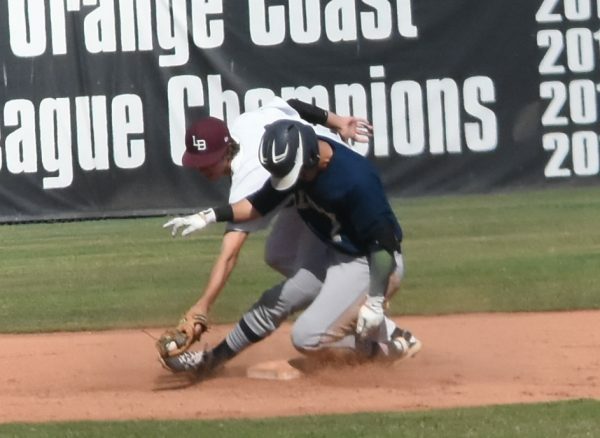 Laguna finished its spring break with Grady Morgan delivering a dramatic “walk-off” home run in the bottom of the eighth inning to lift the Breakers to a 3-2 victory and the series sweep of Calvary Chapel (7-13, 4-5) on Wednesday, April 19, at home. Blake Burzell started the game, pitching six innings, giving up two earned runs, striking out four. Ashton Goddard pitched the seventh inning facing three batters and Cutter Clawson the eighth inning for the win. The victory was Laguna’s 15th straight over the Eagles and Laguna now leads the series 33-14. This past week the Breakers face Godinez (1-6, 6-13) in a pair of games at the Grizzly field Tuesday, April 25, and host Godinez Friday, April 28. Next week is the Costa Mesa series with the third place Mustangs (10-12, 5-3). Dante Faicchio’s senior season is approaching a record. The current record for games played is 113 set by Chris Paul (2008-11), who is currently playing for the Ft. Myers A team in the Florida State League. Through the Calvary series, Faicchio has played in 110 games and could break the mark May 5. 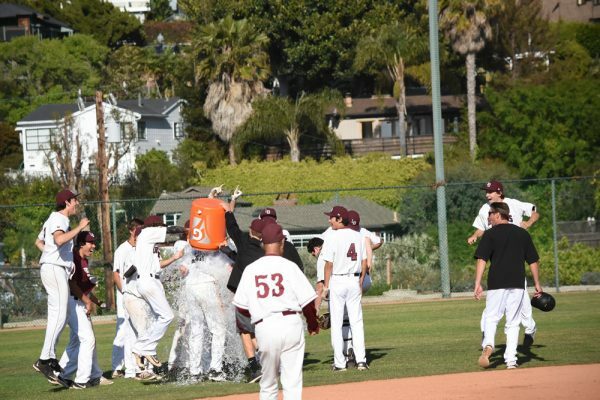 Laguna is playing in their 79th season and Dante currently ranks second all-time in career hits, runs, and doubles. 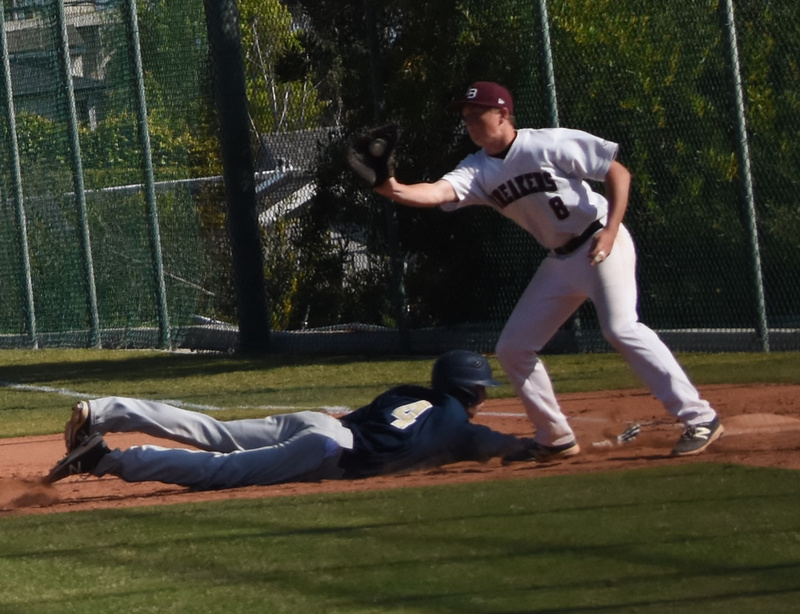 Cutter Clawson snags the pickoff throw at first base Wednesday, April 19, against Calvary Chapel. Grady Morgan gets Gatorade bath from teammates Will Bonn and Dylan Smith, Wednesday, April 19, against Calvary Chapel. 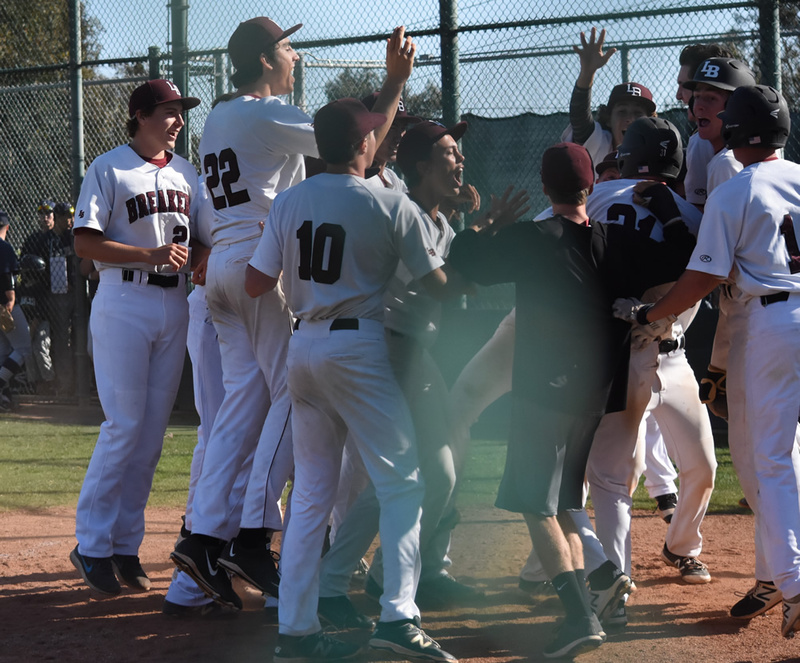 Team celebrates at home plate after Grady Morgan’s walk off homerun Wednesday, April 19, against Calvary Chapel.